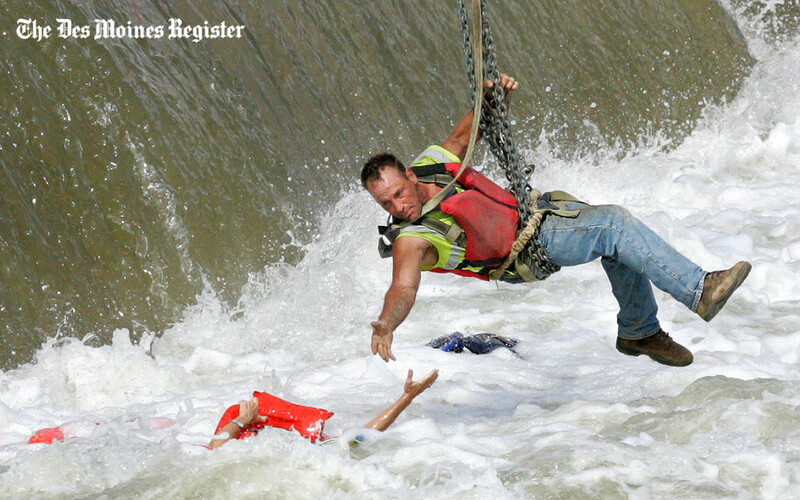 A dramatic rescue at a Des Moines dam in 2009 resulted in a Pulitzer Prize for a Des Moines Register photographer. But there’s more to the story. On the afternoon of June 30, 2009, Patricia Ralph-Neely was struggling for her life in the churning water below the Center Street Dam on the Des Moines River. She and her husband, Alan Neely, had gone over the dam in their boat. Alan Neely died in the accident. Register photographers Mary Chind, now Mary Willie, and Andrea Melendez were in the news room that afternoon. Melendez reported to the scene as rescuers attempted to pull Ralph-Neely from the water. “I remember getting out of the car and seeing the woman in the water and you just get a pit in your stomach and you can’t believe this is happening. You can’t figure out why somebody can’t help her, get her. You feel helpless. You want to help her yourself. It’s hard to stand on the side of the river and take pictures of her and not help her, but at the same time, what can I do,” Melendez said. Melendez’s video camera battery was dead so she called Willie to bring a charged battery. It was Willie who got the prize-winning shot as a man dangled from a crane to rescue Ralph-Neely from the water. One split second captured in a photograph defined the dramatic rescue of Patricia Ralph-Neely below Des Moines’ Center Street Dam on June 30, 2009.